When I hear the words “Martini & Rossi,” I am immediately taken thousands of miles away to my home away from home, Torino, Italy. Following along Via Roma, around my favorite square, appropriately named, Piazza San Carlo, peppered with high-end shops and romantic Piemontese cafes, you eventually stumble upon the neon splendor of the Martini & Rossi sign that frames the underbelly of the portico. I have been and lived throughout Italy, but Torino (or Turin) holds an incredibly special place in my heart. It’s becoming a ritual when I go to my brother’s house that I browse his collection of spirits and create a cocktail on the spot, as dictated by inspiration. This past weekend, the weather was beautiful, as Spring comes to a close and Summer 2012 is upon us. This sweet, but potent concoction tickles the palate with a punch of citrus and berry flavors, perfect for unwinding in the sun with friends and family. Fill a shaker with ice and add the ginger ale, the St. Germaine, the North 44, and the Bianco. Cut the lemon in half, squeeze one half into the shaker and save the other half to slice for a garnish. 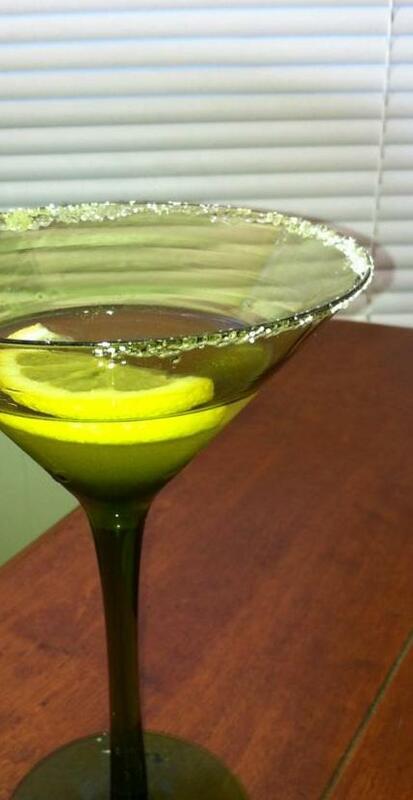 Shake vigorously, pour into a sugar-rimmed martini glass, add the lemon slice, and enjoy!